Apple's decision to abandon Flash made complete sense. The unwieldy format demanded way too much in System and battery resources and Adobe was unable to successfully transition it to modern mobile devices. "New open standards created in the mobile era, such as HTML5, will win on mobile devices (and PCs too). Perhaps Adobe should focus more on creating great HTML5 tools for the future, and less on criticizing Apple for leaving the past behind," wrote Steve Jobs in 2010. Steve Jobs called it right. There was a big brouhaha, of course, and Adobe persevered with Flash for Mobile until it eventually saw the light and at last put the mobile Flash project out of its misery in 2012. The format has now or is being replaced by more modern mobile multimedia formats, and if it isn't, it should be. Most who come across Flash content on a mobile device will avoid it, but for times when you might urgently need to access it here are a couple of solutions to try. None of these solutions let you play Flash natively on your device, they transcode it remotely and let you watch or work with the results. Be warned, the process can make the Flash on iOS playback experience a little laggy (just like real Flash), but you can at least access the content with just about enough control to play Flash-based games. You can also use alternative browsers to access other Websites, like any other browser. The most popular solution, Puffin Web Browser is free and available for both iPad and iPhone. The free version is limited in that you can only play Flash content at particular times of day -- to play material outside of these times you need to pay $0.99 for six months access. The big advantage is that you don't need to pay to access content so long as you are prepared to only use it during free periods. It also works with many Flash games. The relatively expensive ($9.99) solution is currently available for $4.99. It works with your iPhone or iPad and allows you to access Flash content using the Lightning button. It offers a few advantages including bandwidth controls, tabbed browsing, full-screen view, bookmarks and print features. It is optimized for Flash features including split screen and game support. There are other browsers that support Flash (there is an extensive list right here), but these are the most popular. Another way to access Flash on an iPad or iPhone is to stream it directly from your Mac or PC using Parallels Access. You run applications on your computer that you view and can control from your device -- you aren't confined to Flash, you can run any app on your computer using your device. It does cost $19.99 per year, but if you want to remotely access applications (or files) on your iOS device Parallels Access is recommended. An alternative remote desktop application, the Anywhere Access version of Splashtop 2 costs $17/year and lets you stream all kinds of audio and video assets from your Mac or PC, including games and Flash content. 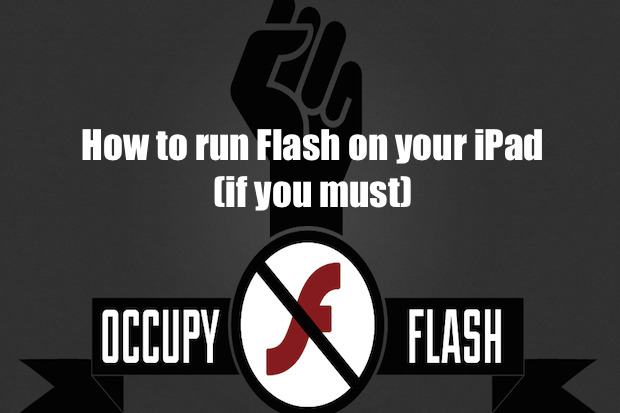 I hope these suggestions help you play Flash content on iOS devices, if you really must.